John Williams is the main man behind our favorite place to grab a craft beer and talk hops, Oak Street Draft House and Cocktail Parlour. He also used to manage Lou's, so he's been around. Now, Williams is opening his second bar. East Side Social Club is opening right down the street from Williams' first bar, nestled cozy right next to the Opera House. After taking a look at the incredible beers that will be available and the diverse whiskey and bourbon selection, you can officially color us excited. East Side Social Club opens up this Thursday, August 29th over at 117 E. Oak Street. Expect to see us lined up and waiting for a double bourbon on the rocks. We'll probably be buying Williams a shot, as well - as a thanks for providing us with one more place we can happily imbibe on the weekends and maybe even munch on a banh mi from The Pickled Carrot. We hear they go great with beer cocktails. What compelled you to open East Side Social Club? Honestly, I just kept driving by it day after day and saw the "for lease" sign on the building. Another craft beer place from out of town had been looking at the building, so I decided I would rather compete against myself than against someone else. I could also picture the patio on the back side of the building and see the potential of it being a corner building that close to the square. What have you learned after being open at OSDH for over a year now? The greatness of the people in the city of Denton. The people in this town is what makes Denton so awesome. Also, I've really learned how giving back to, and being a part of the community makes Denton a better place to live. With the opening of East Side Social Club, you’ll be taking over a large part of Oak St. What keeps bringing you back to that part of town? The rich history of the area because that is where the City of Denton grew from its beginning in 1866. Plus, I like being close to downtown, and I wanted a large patio for people to sit outside and enjoy the open air. Close proximity to the A-Train station was something else I foresee as being beneficial. If you ever had plans for opening up another bar in town, where would it be and why? What can we expect to be different from OSDH? Other than the obvious fact of East Side not being in an old house, East Side Social Club will be very unique - but still have a similar vibe to OSDH&CP. It will have a laid back atmosphere. Of course we'll keep in the tradition of having a friendly and knowledgable staff serving up craft beer and whiskey at a great price. We will have a few TV’s inside and out so that the sports lovers can catch the game, but it will feel nothing like a sports bar. As for beer; we are still concentrating on craft beer, but we have 89 taps instead of 72. 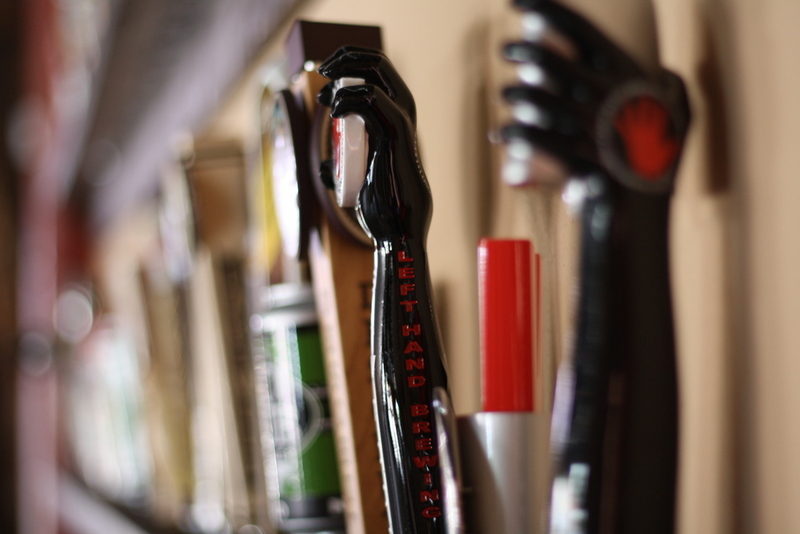 We'll also be focusing on having more regional and Texas Craft beer on tap. Craft beer will still be our passion but we'll be experimenting with beer cocktails as well. Mixing craft beers with liquor and mixers makes a mighty tasty beer-tail. Bourbon and whiskey will be a big player in East Side as well. We plan on carrying over 60 different bourbons, scotches and whiskeys. We'll also have a cocktail menu of highlighting whiskey and bourbon based cocktails from the prohibition area. Lets talk details about this whiskey selection - how many and what kind of whiskey and bourbon are we talking about? And what's your favorite? 35 bourbons, 10 whiskeys, 7 Irish whiskeys, 7 Canadian whiskeys and 8 scotches will line our top shelf. We will be carrying a lot of the local Texas whiskey and bourbon. Jim Beam will be in our well and we have Knob Creek Single Barrel bourbon as our signature bourbon since we hand picked and bought an entire barrel from them. That was definitely a highlight in this process. We actually flew up to Louisville and toured the Jim Beam distillery, and tasted 3 different barrels of Knob Creek. We picked our favorite and now we have 150 bottles of it being shipped to us. My personal favorite would be Garrison Brothers from Texas or Blanton's Small Batch Bourbon. You’re adding on pretty large patios to ESSC also. What have been the challenges and benefits with using such large outdoor spaces? Trying to keep it warm in the winter and cool in the summer have been the biggest challenges - but even in the cold and the heat people still like to sit outside. Once the sun goes down in the summer its not too bad outside. The greatest benefit of the patio is that Texas weather is perfect for patios about 8 months of the year. It also allows us to keep the inside non-smoking for people that don’t want to smell or breathe in second hand smoke. With a large open air patio you can get away from the smoke if you don’t like it. You’ve said before that food trucks will play a big part at ESSC. How will that pan out? Where will they set up? Are you allowing outside food in the bar? Will it be Denton-only food trucks, or are you hoping to get some from outside the city? Once more food trucks open up in Denton we will hopefully have one there from open to close. We have spoken with 4 or 5 trucks who will be alternating between day and night. We would like for them to set up on the side or front of the building and serve to the patio. I would like it to be Denton-only food trucks - but for now there aren’t enough to meet the demand. Hopefully there will be soon. Aside from that, we'll allow people to bring in or order food from other establishments just like we allow at OSDH&CP. What’s your personal favorite bar? In Denton I would have to say Oak St. Drafthouse - because I put a lot of time and hard work into opening it. The people that I’ve met there over the past year and a half make it very special to me. Other than that, it would have to be the Lustre Pearl in Austin. It gave me the idea to open the Oak St. Draft House. Oak Street Draft House offers a great atmosphere for drinkers and non-drinkers (or designated drivers) alike. Do you plan on having a similar vibe at ESSC? Absolutely. Anyone can enjoy a night out here by socializing with friends in the beer garden and enjoy a root beer on tap. We'll be offering 1 or 2 root beers on tap along with a few other non alcoholic cocktails and non alcoholic beers. East Side Social Club opens this Thursday. Come join us for a drink and some good times in what we hope will become another great new bar in Denton.